With the wealth of information that today’s golf course management software provides, especially when it comes to pace of play, clubs are increasingly able to use the extensive data provided to make changes that enhance the player experience. In addition to generating increased revenue opportunities through further food and beverage spending and extra tee times, clubs know that when they can offer on-pace rounds, players will keep on coming back. Put most simply, courses that equip their staff with line-of-site tools create opportunities for a far better understanding of the course, and make it easier to provide a consistent pace-of-play and optimal player experience. Tagmarshal, the industry-leading golf intelligence software, already services more than 150 courses throughout North America and has gathered just shy of a billion data points during that time. Rather unsurprisingly, the most successful facilities follow a similar recipe when it comes to managing their on-course operations, and this is borne out by the data collected. They understand their golf course, not just based on intuition (although this certainly helps), but also through the analysis of quantitative data and established trends. They’ve tailored a pace-policy that matches their course’s unique characteristics, which includes dynamic goal-time setting and efficient resource allocation, such as marshals placed strategically at select times of the day and week. They generate awareness among members and guests regarding said pace-policy, ensuring that groups and players know exactly what is expected of them. They equip teams responsible for managing the golf course with line-of-sight tools, an understanding of what to look for before problems arise, and the skills and authority necessary to intervene when needed. Finally, they capture and analyze course data, and are constantly refining their approach and looking for key areas of improvement. A course that follows these five habits, pairing an in-depth understanding of their offering and extensive quantitative data, is one that sets itself up for success going forward. Take for example Canyon Springs Golf Club in San Antonio, Texas. They realized that it’s not simply enough to keep tabs on average round times and dug deeper into the Tagmarshal analytics. They found that there were a number of very quick morning rounds, which skewed the average round time downwards. For example, there were 13 rounds in August faster than two hours (more than likely one- or two-balls), and 11 such rounds in September. As such, a better measurement to consider when analyzing round-time trends would be the median time and distribution in relation to the existing goal time. Here, the median is generally five to six minutes slower than the average, which is to be expected considering the aforementioned sub-two-hour rounds. 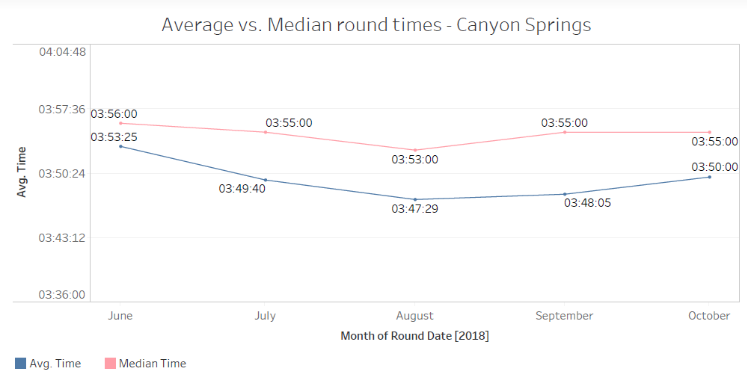 Going forward, Canyon Springs would be best advised to use the median time as the measurement, rather than the average. It’s Tagmarshal reports like these, along with many best-practice pointers, that enable courses to achieve their key objectives and optimize the on-course experience.